Plate 1 from the first set of Thomas Daniell's 'Oriental Scenery.' 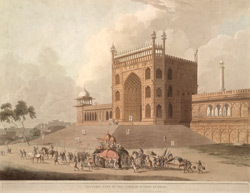 The Jami Masjid of Delhi, the largest mosque in India, was built between 1644 and 1658, as the principal religious monument of the new capital of the Mughal emperor Shah Jahan, established in 1638. It stands on a high platform on a rock and has three massive gateways approached by broad flights of steps that lead to a spacious courtyard. The gateways and walls are made of red sandstone and are topped by marble domed small pavilions or chhatris.